Cover Art, featuring actual art. Disclaimer: This review is mostly based on a read through, but not a playthrough, and a preview/pre-release document, so perhaps some things will change between now and the true release. That out of the way, yesterday I went for something a little short... a very little short to review to get myself back into writing shape for the next few reviews. 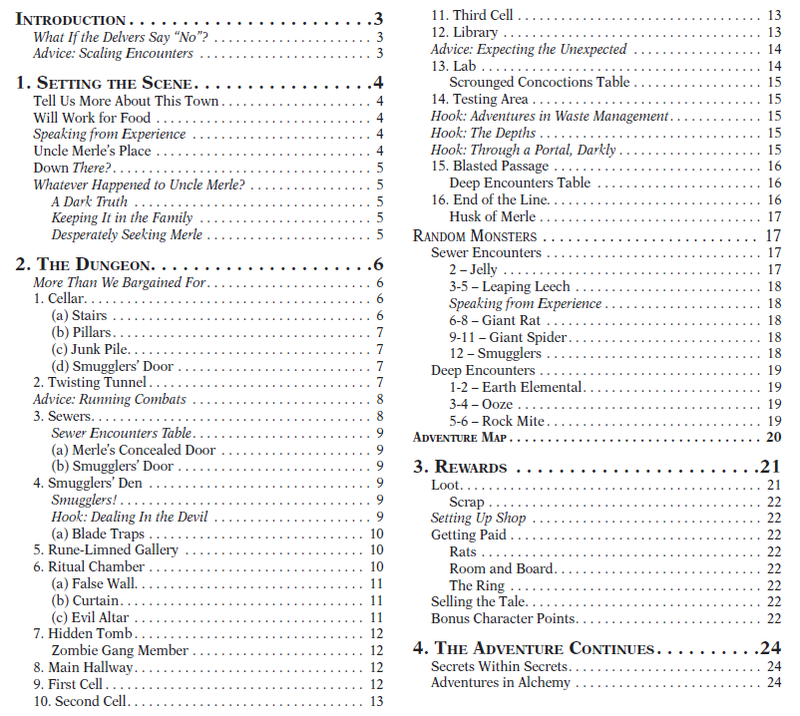 Today, I'm walking through the 26 page introductory adventure, I Smell a Rat, written by Sean Punch. 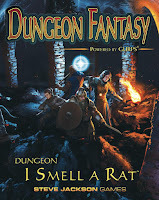 In any case, the adventure starts off with the well known cliche of a bunch of adventurers gather to help someone clear a basement of rodents, and somehow, a complication arises, and things aren't exactly as they appear on the surface; of course they aren't. The adventure is well put together, and with my experience with novice players, a very new group might take two to three 3 hour sessions to complete the adventure, while an experienced group that gets down to brass tacks, can probably finish it in one session with a little bit of overtime. A warning right now: this might include some spoilers for players, though I intend to keep the spoiler potential as small as possible, it might become necessary to name some plot specifics in the name of giving an informative review. Let's take a deeper look then. The book starts off with a one page introduction, that explains a few of the goals of this dungeon, namely, to acclimate brand new Dungeon Fantasy GMs and players to the mechanics of the system with a cohesive adventure, and give a springboard for further adventures or a long running campaign. 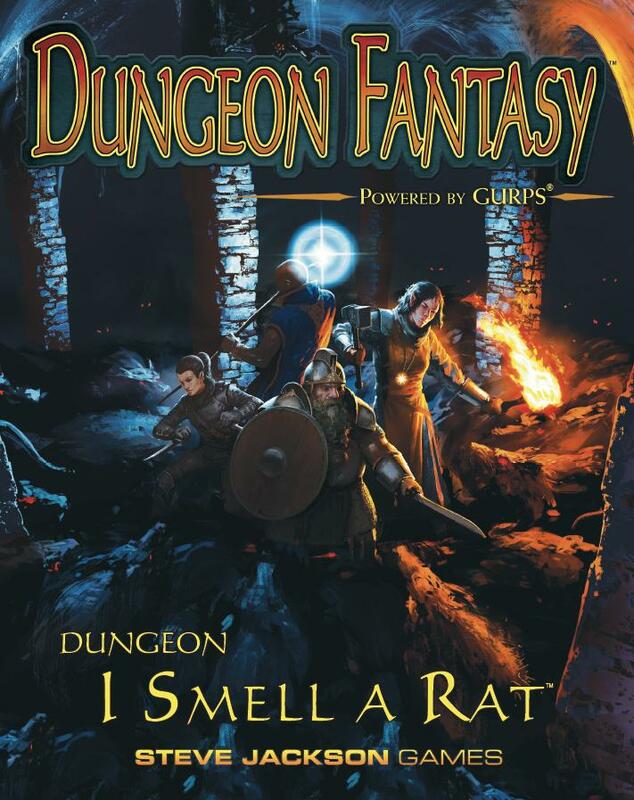 It specifically mentions that the book is meant for the GM's consumption and not the players, so as I said before, if you intend to play this dungeon as a delver instead of run it as a game master, I implore you to consider reading this review after you have had your chance to play through it. 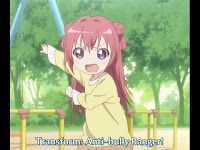 As an aside, I appreciate all the meta-advice. Even as someone with a few years of GURPS behind my belt, I think the kind of hands-on guidance in this book on how to run an adventure is something that has been sorely needed for the game. The advice is a little situational, and not so generic, but it still is helpful to get some kinda anchoring on how the designers intend for a game to be run. That just might be my learning style though. I appreciate a good example to riff off of before I begin to experiment and deviate from the formula; which by the way, interestingly, this book has lots of asides with ideas to complicate or de-escalate challenges as appropriate, which is another fun way to see what kind of dials a GM might play with to customize an adventure to be fun for her group and her players. 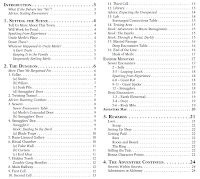 In a Meta-sense, the book has the typical publishing layout of other GURPS/Dungeon Fantasy books, and is in color. The illustrations are top notch, and there are lots of interesting vignettes here and there. I kinda miss the pop-fiction pull-quotes you nominally see in GURPS books, but the fictional accounts of important NPCs are interesting that they have elements of flavor and color, while actually providing player or game master useful advice. This chapter builds up a few details about the town and the current situation, setting up plot hooks to lead the players to the start of the adventure. It gives some pointers for making a city that integrates holistically with any bigger plans the GM might have, such as pointing out what window dressing might or might not be appropriate, or what going-ons might help direct the players towards starting the adventure proper. It interestingly anticipates a lot of the ways players might want to research the situation and how to handle them, and gives players options to satisfy problems that are typical for beginning adventurers: getting accommodations easily, finding a way to store loot when the party usually can't afford things like carts or storehouses yet, and similar. This chapter goes over the contents of the dungeon proper. The format goes room by room, and then under each room, notes of important details in each room. The details are extremely verbose, so helpful for a new GM to consider all the implications of say, dealing with traps in a pitch black room, or combat on a stairwell, but possibly difficult to count on in the heat of a game session. It might go without saying, but a GM probably should familiarize herself with the contents before a session begins, instead of counting on the material to illuminate them during play. 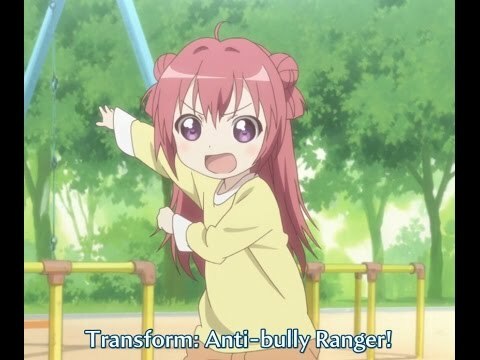 is a bully free safe space. For example, the text about the first room, a wide open, dark room with some rubbish in the corner, some stairs, a door, and a few pillars has almost a page of details. The stairs, go on for three paragraphs explaining how high ground and low ground benefit melee or ranged combat, how difficult it is to destroy the stairs, and what the consequences of falling from the stairs would be. Indeed, this is all helpful information for the novice GM trying to get a handle on what the Dungeon Fantasy and GURPS systems can allow for, but it looks to be overwhelmingly thick if a GM wants to read up in the middle of a game for spur of the moment tips. The chapter includes a good mixture of challenges that require a variety of skills, none of the occupational templates from the Adventurer's book are left entirely in lurch, even the socially oriented Bards have opportunities for negotiation and applying knowledge. The chapter ends with stat blocks for most of the monsters, those being repeats from the Monsters book are slightly abbreviated, but it is a welcome bit of redundancy to not need to flip back and forth between two different books for stats. There are also maps, and these are included in a separate document as well, but I lament, even though they look super cool, there are no annotation-free maps, meaning things like secret doors are clearly marked for all players to see. This chapter includes lots of details on the types of treasure a party is liable to encounter. It seems a little weird at first to specifically partition the loot out of the main dungeon chapter at first, but makes sense when you begin to think that the specs are something that make more sense to worry about in downtime focused on evaluating the value of treasure or selling it. A perfect job of clearing out the dungeon can net the players several thousands of dollars worth of goods, which, as an aside, is interesting in that it is a great deal less money than I typically include in dungeons, and the stuff that is found is a bit more useful than the stuff I leave lying around. Perhaps that strikes a balance. Moving on, after the mundane list of items, there are a few bits on more complex methods of milking the dungeon for money, and a small guide for character point rewards. In theory, I think the character point checklists are interesting, but in practice, I find them cumbersome. That said, the really long checklist is just about in line with how I reward my players in Dungeon Fantasy games. This is a short one page chapter, but interesting, and probably not well-named. It feels more like a "miscellaneous other cool things you can do during the adventure with advanced players to surprise them," but that's a long chapter name. It adds a few extra ways to find treasure and make money, which are all decent food for thought for other adventures. A fun dungeon, and I want to try running it with my current party soon. If I get any surprising insights from actually running it, I might add a follow-up post to this preview review. Altogether, it has some good advice, involves a bit of lateral thinking, and anticipates a lot of unusual actions from players. I sometimes think some sections are a bit too verbose to be able to helpfully refer to them in play (Though Dungeon Fantasy and GURPS encourage you to learn to "Roll and Shout" if you don't know the immediate text book answer to the wacky problems of "If I have a cheap pick axe made for a left handed delver but I lost my left thumb, and want to burrow through a fine quality stucco wall, how many hours do I need to spend on architecture to make sure I don't cause a cave in?") The printable sized maps are good quality, but I think it's unfortunate that they are annotated, which makes any surprise elements a bit less surprising when you see a big (2) on the ground near a wall.... I guess at least they don't know if the (2) means "This wall will explode if you get too close" or "This wall has a cool thing hidden inside," so in that respect, there is still a teeny bit of mystery. "a preview/pre-release document, so perhaps some things will change between now and the true release"
Only we will all have our copies. Nice for the PDF I guess.